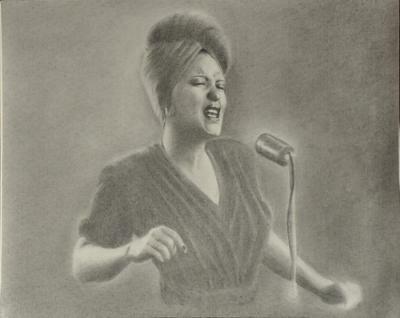 I wanted to submit my drawing of Jazz singer Billie Holiday. It seemed appropriate and I used learn-to-draw-expressively as a resource while doing this charcoal drawing. I've found Doug's site to be a wonderful resource while learning. I especially like the videos where I get to watch him work. I find his artwork "expressive" and emotive. I feel as if I'm in the smokey club and I can hear the Jazz playing in his drawings. I was drawn to Billie Holiday because I love jazz and music overall. I loved this image of her caught in mid-song. I wanted to capture that expressively. I've used charcoal for the first time. It was done mostly in Vine charcoal. I used charcoal pencil to bring out some of her facial features and I used a chunky charcoal stick and charcoal dust on the background. I may go back and work some more on her, taking the suggestions that Doug has given me to improve her, but I was anxious to share her and to thank Doug for sharing his knowledge here on learn-to-draw-expressively.com. Doug's comments: As a gesture drawing this is well done, and it conveys a feeling of realism. The lifelike quality is enhanced by attention to lighting. Thanks for submitting your drawing. New to this site I feel I am going to be getting no sleep tonight. and the but is that by giving you four makes you feel that you need to keep working-I think that's important that even when you good,and that you are,you should never think that you've mastered it all and don't need to practice but always push yourself to get more connection each time. Alas no real art critic myself, I chose to comment because I honestly do like your drawing. I wonder sometimes if anyone would believe their "five star" rating or merely think of it as a kind compliment to not hurt feelings? ... ah I don't know,but seriously man its soulful, feels as if I could smooth move along to my viewing eyes! Keep at it!